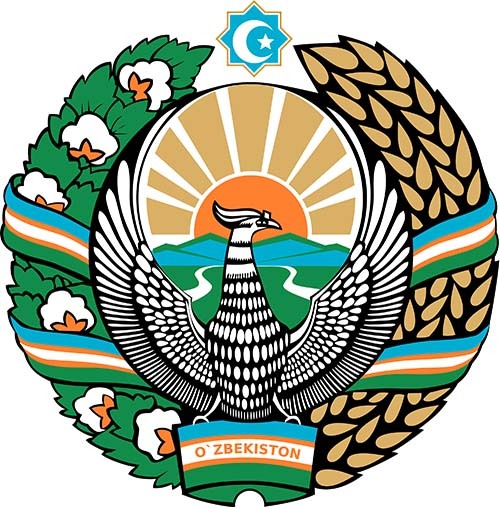 The law about “The State Emblem” was approved by the 10-th session of the Supreme Council of the Republic of Uzbekistan on July 2, 1992. The eight-angle star is at the top of the emblem, symbolizing the unity and confirmation of the republic. The crescent and star inside the eight-pointed star are the sacred symbols of Islam. The mythical bird Semurg with outstretched wings is placed in the center of the emblem as the symbol of the national Renaissance. The entire composition aims to express to desire of the Uzbek people for peace, happiness and prosperity. At the bottom of the emblem inscribed the word “Uzbekistan” written in Uzbek on a ribbon in the national colors of the flag.